An excited crowd gathered on this part of the promenade in 1918 while a broken-down airship was repaired. A Royal Naval Airship Station had opened on Anglesey in autumn 1915. The airships protected merchant ships in the Irish Sea from German submarines. On April 26 1918, an airship with a crew of three took off from Llangefni, tasked with searching for a German submarine that had been seen near the Formby lightship. After several hours the engine seized and the on-board engineer was unable to re-start it. As the craft drifted towards the North Wales coast, its May-day message was picked up by an armed trawler which came to its aid and towed it to Llandudno. A platoon of soldiers, lodging in the town at the time, was summoned to the end of the pier and took over the tow rope from the trawler. The soldiers walked the stricken airship, which was still airborne, to the promenade and tethered it close to The Hydro Hotel. The pilot was invited to take a bath and a meal at The Hydro Hotel, but when dressing after his wash he found that he had no tie to wear for dinner. He was lent one by the hotel manager, but later recalled that it “was very gaudy for a Naval Officer, and caused considerable amusement”. In the meantime, mechanics had arrived from Llangefni to fix the engine of the airship and inflate the balloon’s envelope. Later in the evening the craft took off from “between two lamp standards” for the flight back to Anglesey. 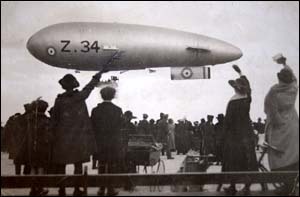 The photo above shows a sister airship at Llandudno promenade later the same year, during the Armistice Day celebrations.